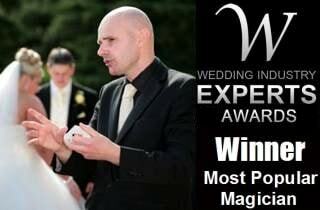 David Fox is Wolverhampton's first choice wedding magician. Close-up and stage magic. 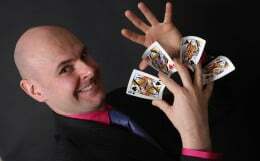 Book magician David Fox for your party in Wolverhampton. David's magic is ideal for any occasion. For special company events in Wolverhampton, magician David Fox is an exceptional corporate entertainer. Are you seeking something astounding for your next occasion in Wolverhampton? Weddings, parties and corporate events in Wolverhampton will be greatly enhanced when David Fox mesmerises all those present with his incredible feats of magic, mystery and mind-reading. For over ten years, David has amazed audiences at many of the finest venues throughout the UK and Europe. As a member of the famous Magic Circle, David takes the utmost pride in creating a unique magical package for each and every event he performs at. For all social events in Wolverhampton, David's exceptional magic is certain to bring the house down! If you are organising a special event in Wolverhampton and require the best in entertainment, contact Midlands magician David Fox now. He is always delighted to provide invaluable advice about how he can enhance your important function.